A common complaint about the majority of DC’s interlinked movies has been how they seem to lack any sense of humanity, trading bright optimism for overly dark brooding, in a misguided attempt to appear more adult and more serious than their biggest competitor Marvel, which ironically makes them look a lot more childish and ridiculous. They certainly tried to incorporate more humour into their films following the backlash from Man of Steel and Batman v Superman: Dawn of Justice, but until now they’ve only had marginal success; even Wonder Woman, one of their better films as of late, didn’t always see the bright side of things, and by the time Justice League came and underperformed, it was pretty clear that the time was right to finally, after all this time, adopt a slightly lighter outlook on life. This has led to their best film to date, and all it took was for it to actually have a sense of humour about itself. Shazam! is about young fourteen-year-old Billy Batson (Asher Angel), who spends his days running away from several foster families in search of his biological mother, who he was separated from as a child. He is soon taken in by a kindly couple, who pair him up with disabled superhero fanatic Freddy Freeman (Jack Dylan Grazer) as his roommate and de facto foster brother, but Billy has no room in his troubled heart for a makeshift family. One day, Billy is transported to an ancient realm occupied by an elderly wizard (Djimon Hounsou), who reveals that Billy has been chosen to be his all-powerful champion that must protect the world from evil. Billy is granted a wide array of superpowers, as well as an adult male body (Zachary Levi), whenever he says the wizard’s titular name – but seeing how Billy is still a kid at heart, he and Freddy almost immediately set out to take advantage of these new powers, including purchasing beer at the local store and skipping school during the day. However, it comes time for Billy to step up his superhero game when Dr. Thaddeus Sivana (Mark Strong) enters the scene, sporting a rock in his eye that summons evil demons representing the seven deadly sins, after a childhood prologue reveals he was initially chosen, and then rejected, for the power that Billy now possesses. Full of the kind of excitement, child-like wonder and most of all fun that everyone was begging DC to incorporate into their movies from the very beginning, Shazam! is an incredibly enjoyable family movie that manages to combine the fantastical wish-fulfilment of Big with, well, a superhero movie, and it blends those elements incredibly well with the right amount of humour and a tremendous amount of heart. I say it’s a “family” film, and that is more accurate than you may think; a major theme of the film is indeed about the important of family, something that both the hero and the villain of this movie go through at some stage, albeit in very different approaches with varying degrees of violence. Billy, being a foster kid who’s spent his whole life trying to find someone who very clearly hasn’t made an effort to return the favour, is understandably reluctant to suddenly accept this new family into his life, despite them all being a very likeable and functioning unit (Grazer, until now best known as the neurotic Eddie from It, is a major standout, but watch out for young Faithe Herman as little Darla, the film’s secret weapon in more ways than one). Meanwhile, Sivana has some family issues of his very own, which are also highlighted in the film’s opening prologue, and have also caused him to go down the more sinister path we see unfold throughout the movie. In a sense, family rejection ties both hero and villain together, forming themes that director David F. Sandberg clearly has great admiration for, as well as a tremendous amount of sympathy that he gives both characters, making them a little more fleshed out than a standard superhero hero/villain pairing. This gives the film a big, beating heart that’s impossible to reject, and it makes for an incredibly sweet but also poignant message that most ages can appreciate while watching it. It is also – no duh – the funniest film that DC has put out in years, possibly even ever; there are moments of dark humour sprinkled throughout, whether it’s testing bullet immunity during an attempted robbery, or some of the weird horror-movie imagery that you’d normally find in a film like this from the 80s (this is something that’s clearly in Sandberg’s wheelhouse, having previously helmed horror movies Lights Out and Annabelle: Creation), but it’s all held together by an energetic comedic performance by Zachary Levi, who brilliantly captures the child-like wonder of a kid that’s suddenly become a superhero, and does exactly what a kid with that power would do: use it to bum around and act cool. Levi’s a lot of fun, Mark Strong makes for a decent villain, and Grazer is a charming comedic support; all of them, plus their numerous co-stars, deliver the comedy with impeccable ease, though they have the advantage of working from a script that’s already written to be pretty damn funny. You’ll end up laughing in places you never thought you’d be able to laugh, but you’ll also be charmed by its likeable characters and incredible sense of heart, which really does set itself apart from all of the other DC movies so far, even the better ones like Wonder Woman and Aquaman (while there are references to the other superheroes in this universe, it doesn’t go too overboard with them, enough to make this feel like a perfectly solid standalone). Minor criticisms are exactly that, including a runtime that’s a little overlong, and a couple of editing choices that don’t always match, but it’s really nothing that brings the movie as a whole down. 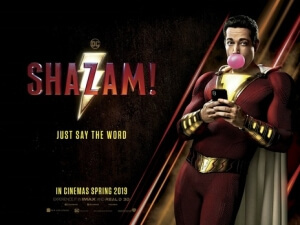 If you want a different kind of superhero movie that’s charming and funny, but also does its own thing without falling too much into the formula established by Marvel, then Shazam! is a powerful and extremely enjoyable movie to fly towards. Hopefully, we’ll get more movies like this in the DCEU soon, because this series really does work best when it actually smiles. Shazam! is the best DCEU movie to date, and not just because it’s the funniest, most optimistic and most big-hearted of their movies thus far, but because it has a meaningful story with plenty of strong themes, and a great cast of likeable characters that are impossible to reject. A real super treat for the whole family.